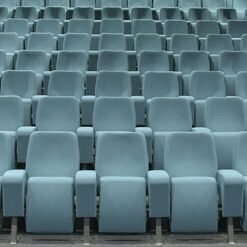 TS10 Theatre seats from Auditoria Services come as fully upholstered, floor fixed theatre chairs. 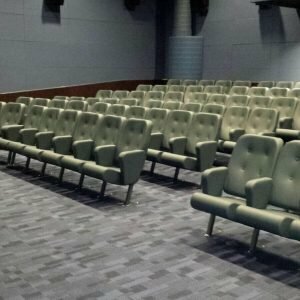 This luxury theatre seating comes with a thicker feel seat and back, available with and without armrests. 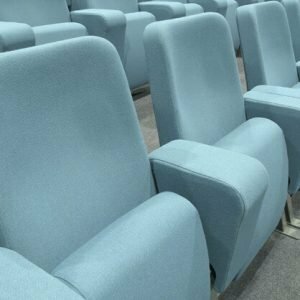 For more information on luxury theatre seating get in touch with a member of our team. 500mm* front to back upholstered moulded 125mm* thick CMHR 50* foam, supported on 12mm* thick high-density birch plywood base curved back to front for comfort. 8mm* capping to underside of seat with zip fastened cover in selected material. 595mm* top to bottom, constructed on a 10mm* thick pre-formed plywood base. Upholstered with 100mm* moulded CMHR 50* foam incorporating lumbar support. Outside back finished with 3mm* upholstered outer plywood with 6mm capping foam, covered in selected material. 300mm* long x 70mm* wide (minimum) timber constructed box design with inner and outer side panels. Upholstered CMHR 25* with a 6mm capping and covered in selected material. Constructed of hollow section steel 40mm* x 40mm* and flat bar, complete with pivot action brackets including nylon bush and silencer buffer. All steelwork is powder coated to RAL 7016 anthracite grey or RAL 9005 black as standard. 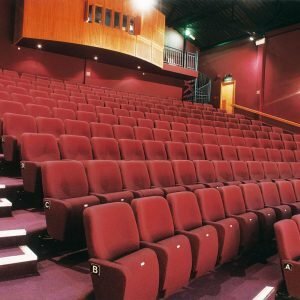 Outside backs and under-seat bottoms can be supplied with 3mm* clear lacquer birch plywood panels as against fully upholstered at no additional cost. Wooden arms, high backs, seat numbers, row letters, riser fixed and button or pull-through in back.